A new 'on-chip' method for sorting and identifying bacteria has been created by biomedical engineers at Taiwan's National Cheng Kung University. New manufacturing approach may lower solar energy costs. Semiconductor Research Corporation (SRC), a leading university-research consortium for semiconductors and related technologies, today announced the top professors in chip research for 2010. Award to be presented at the Grove Fuel Cell Science + Technology Conference; Zaragoza, Spain, 6-7 October 2010. Delft University of Technology officially opens a new Department of Bionanoscience on Thursday 16 September. The new department will focus on virtually unexplored scientific terrain: the interface between biology and nanoscience. Scientists from Australian National University have developed a 'Superbowl' drug delivery system that promises more accurate doses of drugs with fewer side effects. Arizona State University's expanding research, education and entrepreneurial endeavors in photonics engineering and science has led to formation of the Center for Photonics Innovation. Researchers from Europe and China warn that little can be done to stop dangerous increases in the global sea level, as it will rise between 30 to 70 centimetres (cm) by 2100 even if all but the most aggressive geo-engineering schemes are undertaken to mitigate the effects of global warming and stringently control greenhouse gas emissions. To highlight breakthroughs in this area, the editors of Energy Express, a bi-monthly supplement to Optics Express, the open-access journal of the Optical Society, today published a special Focus Issue on thin-film photovoltaic materials and devices. An international all-star lineup of experts in solar and biofuel energy, climate science, urban design and other areas of research critical to sustainable energy technologies will gather in Berkeley for a public symposium on October 1 and 2, 2010. The light, tickling tread of a pesky fly landing on your face may strike most of us as one of the most aggravating of life's small annoyances. But for scientists working to develop pressure sensors for artificial skin for use on prosthetic limbs or robots, skin sensitive enough to feel the tickle of fly feet would be a huge advance. 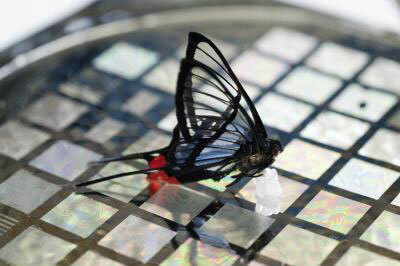 Now Stanford researchers have built such a sensor. 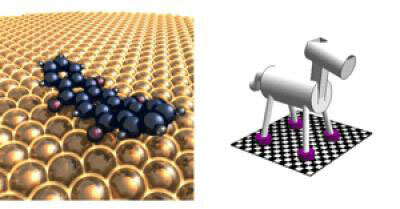 Would a molecular horse trot, pace or glide across a surface? 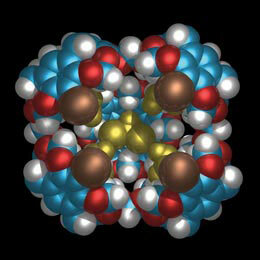 UC Riverside chemists study quadrupedal molecular machines to provide an answer. 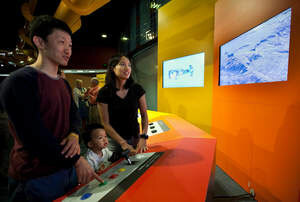 The Tech Museum today raised the curtain on its most ambitious exhibition, The Tech Silicon Valley Innovation Gallery, revealing cutting-edge technology developed by the world's foremost experts on computing, digital design, communication and collaboration. The nearly 3,000-square-foot gallery captures the spirit of Silicon Valley ingenuity, examining the core of innovation -- the microchip -- and immersing visitors in the exciting world of nanotechnology, digital art and mapping. Sensitive, yet tough. That's nanoDESI. The nanospray Desorption ElectroSpray Ionization technique analyzes tiny samples of atmospheric aerosols. CANEUS International will be holding CANEUS 2010 Workshops as part of the International Week on Micro and Nano Technologies (MNT) for Space 2010. The event is being held at the ESTEC-ESA Centre in The Netherlands the 13-17 September 2010. The NSF funded project titled, 'Collaborative Research: New Graph Theory from and for Nanoconstruct Design Strategies', focuses on using mathematics and computers to design nanoconstructs to carry out practical jobs in the future.